The Spongebob Movie: Sponge Out of Water Trailer is Here! Are You Ready, Internet? If you don’t know who the little spongy guy who lives in a pineapple is, then you must be a starfish because you, my friend, have been living under a rock for fourteen years. That’s right! A new feature film by current series producer and director, Paul Tibbitt, along with writers Glenn Berger and Jonathan Aibel (Kung Fu Panda) entitled The Spongebob Movie: Sponge Out of Water. 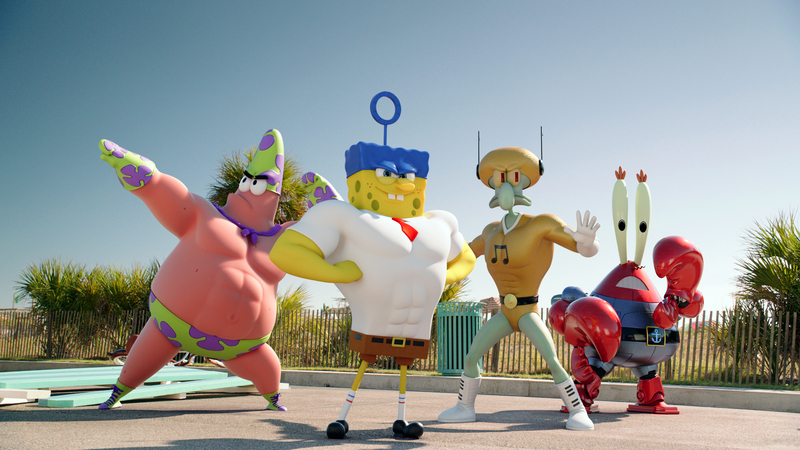 A photo of our four original “heroes” was released not too long ago, presenting them in unfamiliar CGI, superheroic form: Patrick Star (Bill Fargerbakke), Spongebob Squarepants (Tom Kenny), Squidward Tentacles (Rodger Pumbpass) and Mr. Eugene Krabs (Clancy Brown). If you were concerned about this first official image of the film, whether it be from your personal superhero fatigue or because you find CGI adaptations off-putting, this trailer presents equal parts traditional cell animation in the underwater city of Bikini Bottom and CGI form up on the shore. This bombastically yellow extravaganza will release in 2015. Does this trailer shiver your timbers? Are you one of the many purists who doesn’t particularly enjoy the series after the first film in 2004? Do you think you will see this anyway? What are/were your most favorite Spongebob moments ever? But, this is the most important question… Are you ready, kids?